Taking training to a new level, the Livestrong LS13.0T treadmill, lets you journal your fitness progress over time, without taking notes or writing a log. With your personal best stats available at the press of a button, you’ll be motivated to do your best, every workout. The two LED windows show time, distance, speed, calories burned, incline, and heart rate. In the center of the console, the blue backlit LCD window shows Livetrack™ Fitness Journal information. The Livestrong LS13.0T treadmill has fourteen training programs including Heart Rate Intervals, Target HR Zone, Foothills, Rolling Hills, Mountain Climb, 5K, 10K, Race Pace, Weight Loss, Manual, and Custom. Sporting a heavy-duty 3.0 continuous horsepower motor, the Livestrong LS13.0T treadmill is powerful enough for runners, yet the cool-running motor can handle low speed walking, even when the incline is set to a high of 14%. 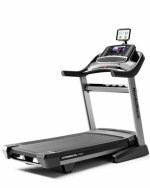 The treadmill features a long 20" x 60" tread belt, advanced cushioning to minimize stress on knees and joints, convenient folding frame, speed and incline toggles on the handlebars, an in-dash cooling fan, and a 12mph max speed. A wireless chest strap is included for heart rate monitoring and control for HR programs. You can track your training progress two ways: on the LS13.0T console, the Livetrack™ Fitness Journal tracks your personal best times, last five workouts, time and distance totals, and more. In addition, users can log on to the website Livestrong.com utilizing the Livetrack Interactive™ Technology at no extra charge. A USB flash drive (included) plugs into the console to track your treadmill workout. You then plug the device into your PC, connect to livestrong.com, and upload your data to your personal account. You can even download exclusive workouts designed by Peter Park, pro cyclist Lance Armstrong’s personal strength and conditioning coach. 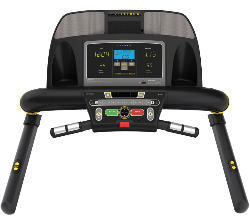 The Livestrong LS13.0T treadmill comes with an Audio Adapter Cable that plugs into the audio-in jack on the console and connects to any MP3 or CD player. You can play tunes through the treadmill’s quality speakers, or plug your headphone into the audio-out jack at the bottom of the console. 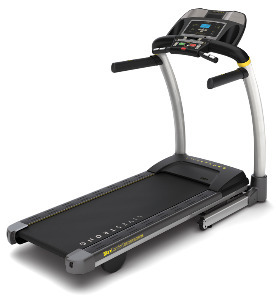 Since the Livestrong LS13.0T model is new for 2011, you won’t find many treadmill reviews on it yet. If you are wondering about the quality of Livestrong Treadmills, which debuted in 2009, you should know that they are built by Johnson Health Tech, which also makes high-end Vision treadmills, as well as Horizon treadmills, a brand which recently saw a big upgrade in component quality. Livestrong uses the same components as Vision and Horizon models, so the reliability and durability is expected to be very good. The LS13.0T comes with a robust warranty of 5 years on parts, 2 years in-home service, and lifetime on the drive and elevation motors. The LS13.0T is a 249-lb machine that feels solid and stable for any user up to 350 pounds. Typically, folding treadmills have not been as stable as non-folding models but that doesn’t appear to be the case with this one – it’s well-built and endorsed by Lance Armstrong. In addition, a portion of the proceeds of each treadmill sale goes to support the Lance Armstrong Foundation for the fight against cancer. 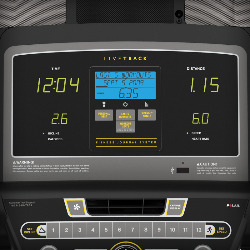 At $1299, the Livestrong LS13.0T treadmill rates a Good Buy.